In the sequel to Jan-Philipp Sendker’s The Art of Hearing Heartbeats, ten years have passed since Julia Win first learned about her family history in Burma. Now with her life in disarray, she has begun to hear the voice of a mysterious woman who is interrogating her about who she is and what she really wants in life. To find the answers to these questions, Julia returns to Burma to visit her half-brother, U Ba, who is suffering a serious illness. Together they learn the story of the stranger in Julia’s head, a woman named Nu Nu who long ago was victim to so much tragedy during the country’s civil war. Although I can’t say much more without revealing too much of the plot, I’ll say that though this may not have topped the first novel, it captivated me enough a second time. Sendker is an emotionally engaging writer, easily pulling you into the trials of these characters. Reading this book gives you a new appreciation for life and reminds you to cherish your loved ones. Sendker’s translator also does an excellent job of making sure that the fluid poetry of his prose remains. This isn’t some cheap appropriation of another culture; it’s a journey that comes from the heart of someone who wants to share the stories of others rather than speak for them. Unfortunately, the last couple chapters went in a different direction than I anticipated, and felt sudden and disjointed. It seems that another sequel may be on the way, and I hope that’s true because like Julia, I wasn’t ready to return to my own world. So while A Well-Tempered Heart couldn’t live up to its predecessor, it’s still a beautiful, entrancing tale worthy of recommendation. 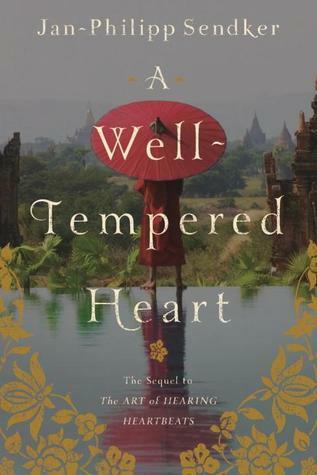 This entry was posted in Book Review and tagged A Well-Tempered Heart, book review, Burma, Jan-Philipp Sendker, literary fiction, The Art of Hearing Heartbeats by Book Club Babe. Bookmark the permalink.